This week I will be going to visit my high school in Arkansas. It was 20 years ago that the school first opened its doors and I was part of that Charter class. The Arkansas School for Mathematics, Science & the Arts is a bit unusual, it is "one of only fifteen public, residential high schools in the country specializing in the education of gifted and talented students who have an interest and aptitude for mathematics and science." And this was a state-wide school, so it was a lot like leaving for college two years early. Arkansas is not particularly well known for its educational system -- as a kid we would joke "thank god for Mississippi" when Arkansas would come in 49/50th in some educational ranking. My brother attended Little Rock's Central High, which is famous for its history in the civil rights movement and the desegregation of the school system). I'm happy to see that Arkansas is doing better in the educational rankings, but there is still a long way to go. For those of you not from the US, I've included a map showing this rural state in the southern part of the US. The school has an interesting history, it was created in 1991 by an act of the Arkansas Legislature. 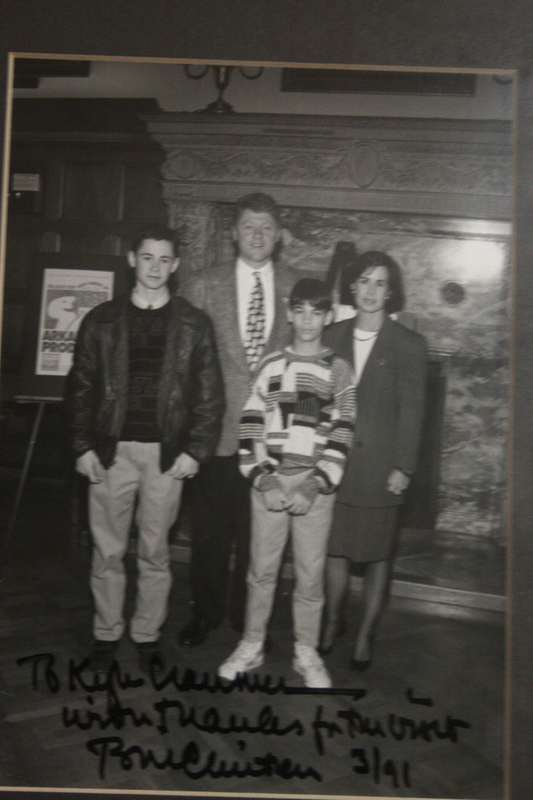 Bill Clinton was Governor of Arkansas at the time, and I happened to get a photo with him that year in his office (wearing my friend's hideous sweater, since my clothes were all dirty while playing at his house). Nobel laureate Leon Lederman, director emeritus of nearby Fermi National Accelerator Laboratory in Batavia, Illinois, was among the first to propose the Illinois school in 1982, and together with Governor Jim Thompson led the effort for its creation. Thompson has noted with pride that he chose to build IMSA instead of competing for the ill-fated supercollider project. This school changed my life. I learned calculus and calculus-based physics from Dr. Irina Lyublinskaya, a Russian-educated Ph.D. physicist that had left Russia due to religious persecution. I took an organic chemistry in high school with awesome labs where we extracted DNA from plants and ran gel electrophoresis. I was frustrated by the lack of activities, so I got involved in school politics. But probably the most important aspect of my time there was learning from my friends and taking on all sorts of projects. I learned some basic electronics from my electronics guru friends Colin and Stephen (who made a TV from a scrap oscilloscope), my friend Thomas made a pretty nice Tesla Coil, we used to get in trouble making potato guns and I almost lost an eye with a rail gun trial. I remember making a binary half adder out of some huge old telphone relay switches, and when I connected the current the you could hear the simple computation proceed knock-knock-knock until the lights at the end of the big piece of plywood I was using lit up to confirm 1+2=3. My friend Sean taught me about programming, my friend Colin taught me about Neural Networks and Fast Fourier Transforms. I spent weeks soldering together an EEG for my science fair project to identify different classes of thought by using brain waves and identifying them by analyzing their characteristic frequency spectrum with a neural network -- an idea I got while watching a documentary of Stephen Hawking. And we were all on-line and exposed to the world wide web in its formative years (93-95). Tomorrow I leave to go visit the school 20 years later. We will meet with legislators, parents, alumni, students, and supporters. I look forward to telling the students about the tremendously exciting career I've had in particle physics, culminating in the discovery of the Higgs boson.